When you have your own sports blog you can pretty much write about anything you want. That said, one of the coolest high school sports championships you’ve likely never heard of takes place today at Sugar House Park in Salt Lake City. Today is the Utah High School state-wide cross country championship and I’ve got two kids that love cross country. The race is a one-day championship event that is the culmination of practically year round training in a sport that is considered very much off the mainstream radar. The races are divided into girls and boys of course and then by school size classification 1A, 2A…….5A, etc. Each race will feature 75-125 kids who all qualified from their region, as a team, or individually. So there are literally thousands of high school runners, parents, coaches, administrators and yes – even spectators. Sugar House Park is one of the coolest places in all of Salt Lake and when it gets overtaken by cross country on this particular day, it makes for a fun scene. What makes watching cross country unique (and even different from distance events in track) is that to be a spectator, you really have to be on the move and run to strategic spots to see the runners as they wind through a typical 2.9 – 3.1 mile course. It makes for a lot of fun. 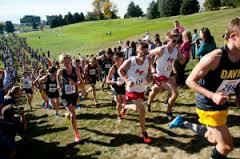 And for whatever reason – Utah seems to take their cross country rather serious. The state has had as many as 5 teams in the top 25 national rankings this year. It certainly helps to train at high altitude and then go run elsewhere in the country. But that’s not all there is to it. 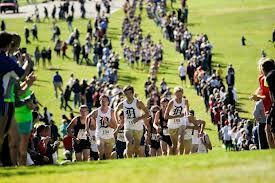 Several high schools here in Utah have huge teams (as many as 40, 50, 60 runners) and only 7 runners run Varsity. So there is constant competition from within your own team to keep improving your times.